Walker and Brown are redshirts and Bai technically could be one too. Walker could leave after next year, but I don't know her plans. It looks like the best Stanford could do is 5 recruits over the next two years. bai boukather & who else will be on scholarship in 2011? I don’t think Bai will be getting an athletic scholarship because she is ok with financial resources elsewhere. But the fact is no one posting on this board (including myself) knows how many scholarships are available. Anything posted on VT is a guess based on second hand information at best. Stephanie Browne is a redshirt, too. I assume she will be back next year, but her injury could keep her from playing or affect her ability. I am assuming it is a knee injury from entries on this board, but don't know the extent. It seems reasonable to say she will be favoring the leg, at least. If Charlotte Brown is still rehabbing Stanford is ultra thin in the middle. Hope so. I was never really a fan of Bryn but boy, Stanford really could have used her these last two years. In my opinion, Jordan Burgess is Stanford's to lose. I know that she likes Stanford a lot, and she certainly wont have any trouble with admissions, as she is one of the very top students in her high school class (and her high school has a very strong academic reputation). Her high school coach (Randy Dagostino- a legend in Florida volleyball) has strong connections with Stanford, as 3 of his all-time top players all went on to play at Stanford (Eileen Murfee, Anna Robinson, and Janet Okogbaa- the latter two for John Dunning). If Stanford makes Burgess a priority in their recruiting (they may only have 2 scholarships to give out for 2012, and there are several potential recruits to choose from), I don't see Burgess going elsewhere. In comparison to recent Stanford players, she sort of reminds me of Kristin Richards. Despite being somewhat undersized at a generous 6'0'', she can definitely bring the heat when she needs to, but her best attributes will be her passing and back row skills. Stanford could certainly use a strong passing leftside hitter. 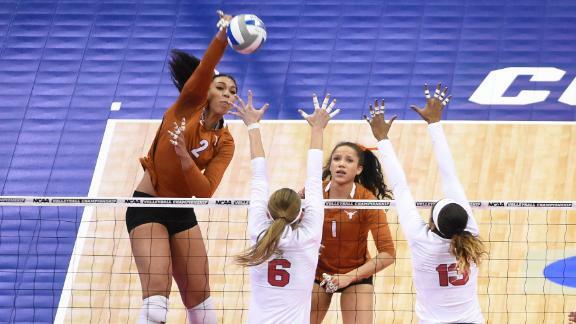 I could definitely see her starting as a freshman, either at OH2, libero, or DS. She'd compliment them really well. All of Stanford's outside hitter now are great athletes but are, for lack of a better term, raw (although not in the traditional sense). Williams has a great armswing but has not shown that she has a wide array of shots or that she can be a primary passer. Sam Wopat is a little too erratic. Bai was beginning to find her groove during her senior club season but has since been shuffled around in practice a lot, which might have hindered her development. Boukather is just transitioning to the outside and still needs work in the backrow and in the weight room. I think Williams will improve leaps and bounds by next year but who will play opposite her? Howard is a good attacker but she is similar to the girls I mentioned in the sense that she is not a good backrow player yet and IMO needs to fix her armswing. Burgess, however, is very polished in all phases of the game. IMO, Stanford hasn't been very good at developing its "raw" recruits (with the exception of Akinradewo) and I think they just need someone that can come in and be solid for them instead of another athlete with a high ceiling who might take a few years to be ready to play.